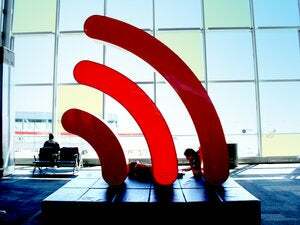 Thanks to Apple’s AirPort technology, every Mac is capable of wireless networking. In 2007, that technology is going to get a significant speed boost. The current generation of Wi-Fi technology—known as AirPort Extreme to Mac users, and 802.11g to everyone else—appeared in 2003, and it’s showing its age. The engineering standards group IEEE has been working on a new wireless networking standard, 802.11n, for two years now; the first stable n products will likely appear this spring. While 802.11n will come in several flavors, even the slowest will be rated at 150 Mbps (meaning that its actual throughput will be around 100 Mbps). The 802.11n standard will also provide greater range than its predecessors (802.11g and the earlier 802.11b, which was the basis for Apple’s original AirPort hardware). The combination of high speed and long range should make 802.11n great for streaming DVD- and HD-quality video around the home. Current Wi-Fi technology can handle only a few standard DVD streams and only one or two HD streams at a time. That’s why Apple’s hyped iTV will likely use 802.11n at some point (see The Mac Media Center ). But there’s a question of timing: the IEEE’s 802.11n task group probably won’t release its next draft of the standard—Draft 2.0—before March 2007. A final version may not be ratified for another year. Draft 2.0 gear will also need to be tested for interoperability by the Wi-Fi Alliance, which controls the Wi-Fi name. Apple released AirPort Extreme six months before the IEEE finalized the 802.11g standard, but that standard was much more settled at that point than 802.11n will be by this spring. So iTV probably won’t have 802.11n initially. The safe bet is that Apple will ship the first iteration of iTV and early 2007 Macs without 802.11n but will inte-grate the faster standard into its products by the middle of the year. When 802.11n does appear, you’ll be able to pick up Apple-branded n equipment, at the usual Apple premium. As for third-party equipment, make sure it has the Wi-Fi seal of approval from the Wi-Fi Alliance.